So, the Barrel Aged Vegetarian and I went on a trip to the Pacific Northwest! Going on vacation is much like going camping; it feels like a re-start after a computer crash. Everything is fine afterwards (well mostly). Upon returning from vacation, and getting back into the groove, I knew I needed to make some changes in my day-to-day life so that I could be happier and more fulfilled at the same time. Get the hell outta dodge! Get your booty to a different city, and experience the different people, culture, restaurants, and nature. We get so accustomed to our patterns, and living our daily lives, that we may not realize that people behave differently in different cities, and that there is a plethora of natural wonders to explore. It doesn’t have to be a week-long vacation to a city hundreds of miles away, either. If it’s not in your time or monetary budget, take one day to escape from your normal routine. Seek out a park in a nearby city you haven’t been to before. Go to a museum. Schedule a massage. Set up an umbrella and lounge chair in your back yard, and sip on an ice-cold lemonade for an hour. I classify all of these things as “vacations”! Really, it just means to remove yourself from the daily grind whether it be for an hour or a week. Take a few minutes right after you wake up in the morning, and before you go to bed at night, to sit and breathe. Clear your mind, and concentrate on your breathing. For 4 counts, take a relaxed breath in, and for 4 counts, breathe out. Continue this for as long as you can. Normally I last about 2-3 minutes, but I’m new to it, and am a work in progress! I’d like to make it to 10 minutes personally, but meditation is a practice, which means…. you have to practice it! As you meditate, you may find your mind wanders to the things that are most present in your life, but gently bring yourself back to focusing on breathing when you realize you’ve lost focus. Meditation helps clear your mind, creating space for renewal and inspiration. It has definitely helped me keep my focus lately. Writing things down is a great way to clear space in the mind. I can’t tell you how many different journals and notebooks I have near me at any given time. I write down lists when I know I’ve got a lot of things to accomplish, freeing my mind of them so I can concentrate on them one by one, instead of being overwhelmed by all of them. I do this especially when I’m overwhelmed with all of the things I want to do in any given day. Taking time at the end of the day to take note of your experiences, things you enjoyed, things you’re grateful for, things you want to work on is a good way of not only freeing your mind, but organizing your thoughts to take action on any circumstance that needs attention in your life. This can help keep you focused on the things that are truly important to you. This follows the journal section in that you can write down, or simply think about the things that serve you, and the things that do not. I recently met with a dear friend, and we talked about our goals for our lives, and what our “end game” was. If our actions or activities that we plan did not support our “end game”, then we should not waste our energy on them. Your “end game” is your ultimate goal in life. Take the time to sit down and identify that, and the steps it will take for you to get there. Identify the steps within the steps until you know exactly what you have to do to reach your end game. I know it sounds like that may take a long time, and it very well may, but you are worth the investment. Once you determine your end game, you can create space by determining all of those things which are not contributing to your end game, and rid your life of them. I feel that it is so important to take care of ourselves, and create space for ourselves to breathe, heal, relax, and open ourselves up for rejuvenation and inspiration! Personally, I often forget to simply stop and look around at the state of things! We can get so caught up in our daily grind, that we lose focus of what we are on this Earth to do, whatever that may be. When we create space, that brings us back to what we are called to do. We unlock our true power and are able to focus on the things that are the most important in our lives. My calling is to inspire people to care about where their food comes from, and to support local businesses and farmers. 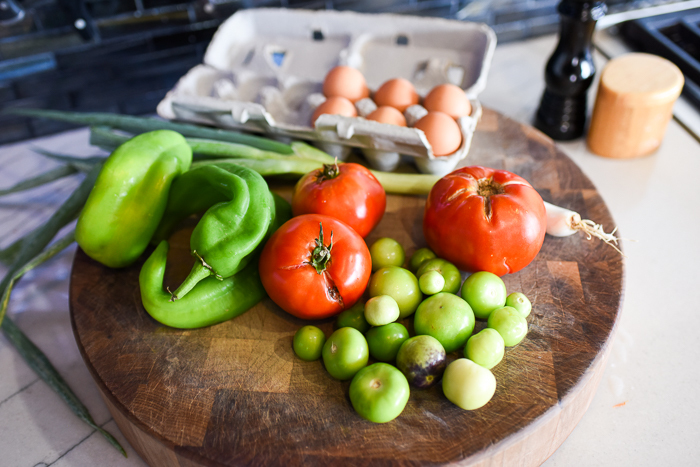 I want to create recipes that de-mystify what to do with less-than-normal ingredients, while bringing communities together. 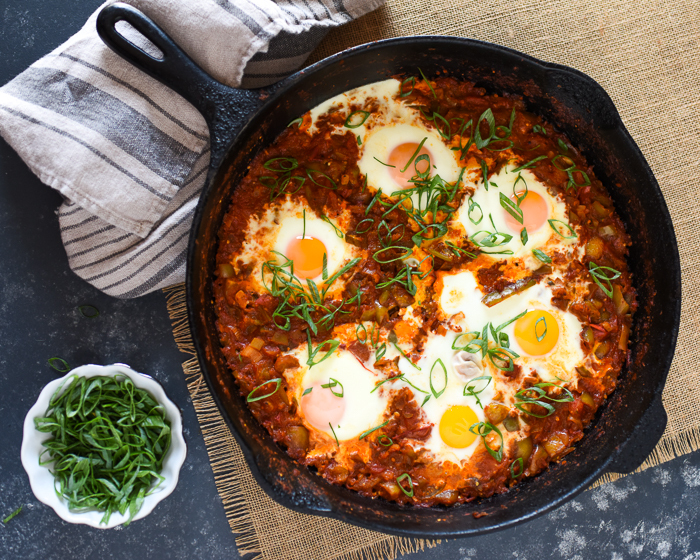 With that said, I bring you this simple, flavorful shakshouka dish that comes together effortlessly! Hatch chile season is at it’s end, but I’ve still seen some floating around the supermarkets and farmer’s markets around Southern California. If you got in on the roastings, you can use your roasted hatch chiles in here too! Add in about 3/4 of a cup instead of the fresh 1 1/2 cups, and you should be good to go! 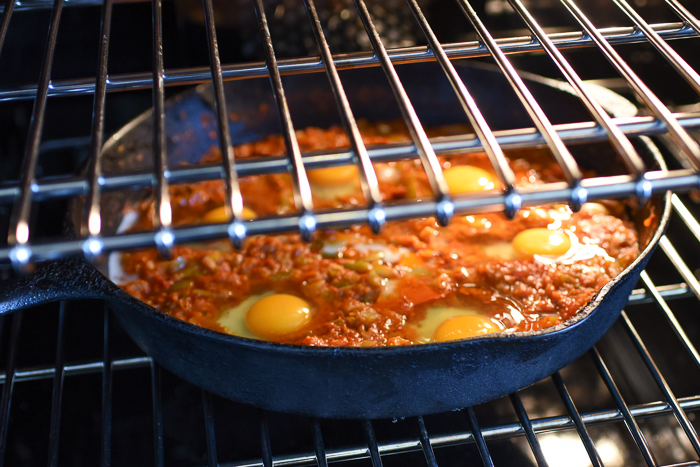 Make sure you have an oven safe skillet like this 13.25″ Lodge cast iron for this dish too, as you’ve got to finish cooking the eggs in the oven. This is a wonderful tool that I use time and time again in my kitchen, and I personally feel that every single kitchen should have one. Cheers to creating space in our lives so we can be happier and healthier! 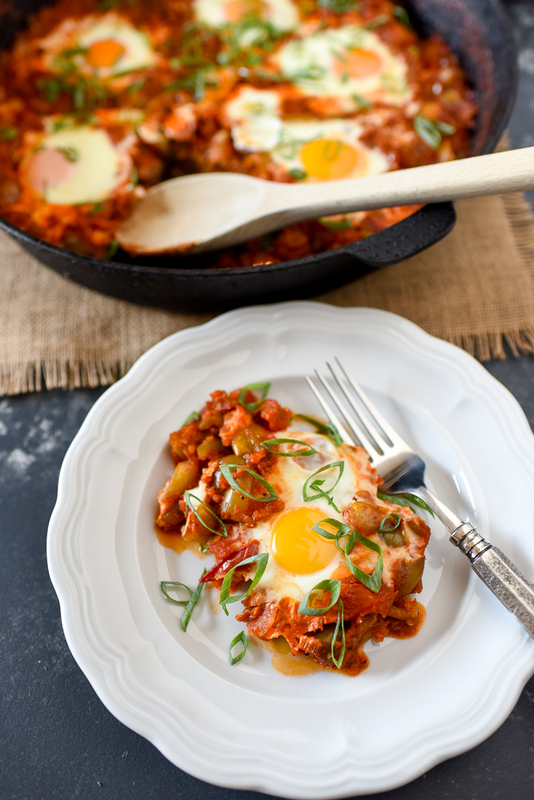 A Moroccan dish made typically with eggs poached in a tomato sauce with chiles and onions. Here, we use New Mexico Hatch Chiles in fresh and powdered form! 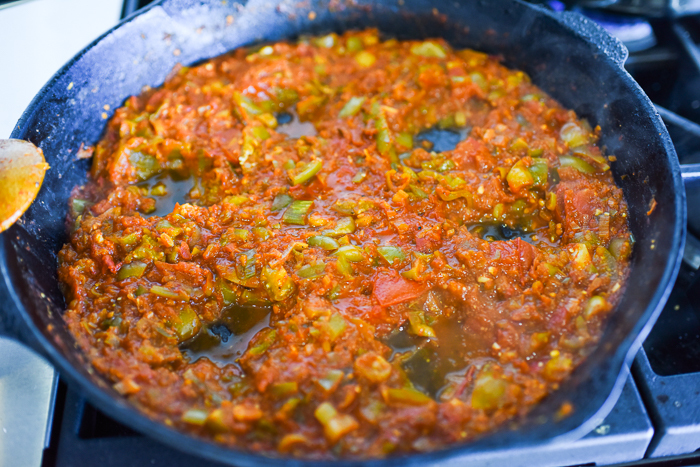 Heat a large, oven proof skillet over medium heat and add the Extra Virgin Olive Oil, onions, tomatillos, hatch chiles, salt, pepper, and chile powder. Stir with a wooden spoon until the onions are translucent, about 5-7 minutes. 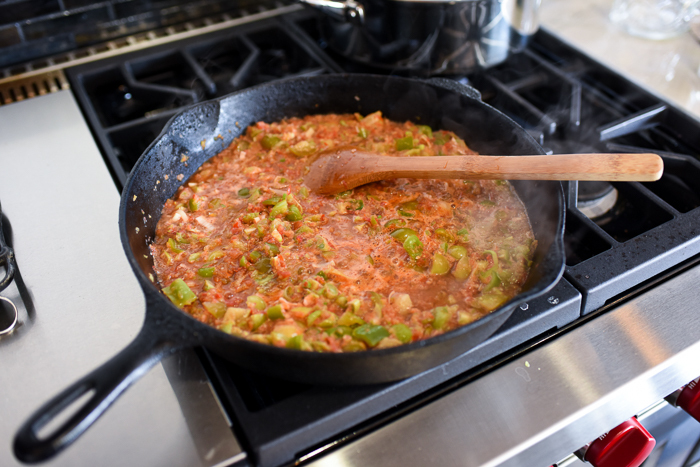 Place tomatoes in a food processor or blender, and pulse until finely chopped, and add to the pan. Stir and let cook until reduced a little, about 5-7 minutes. 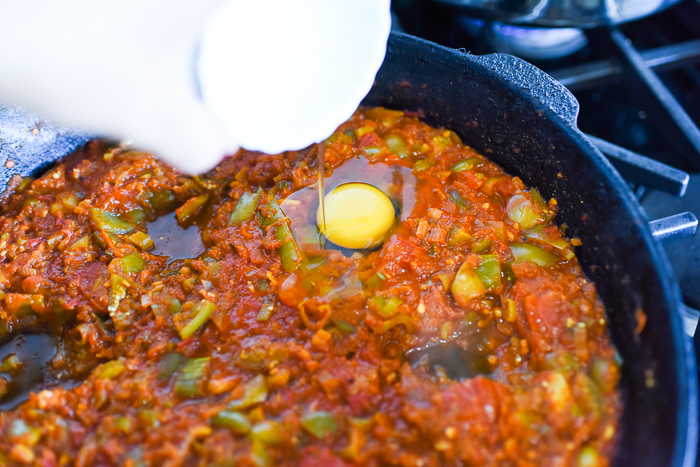 Make six wells in the skillet with your wooden spoon for the eggs. 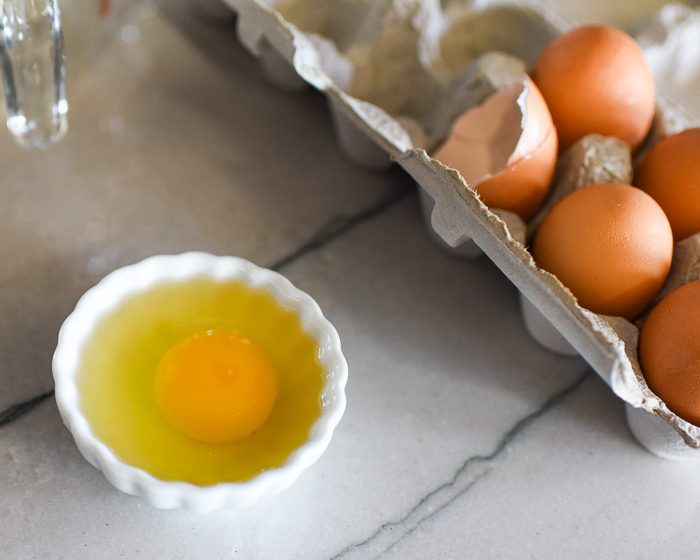 Crack the eggs in a small dish, one by one, and gently pour into the wells you just made. 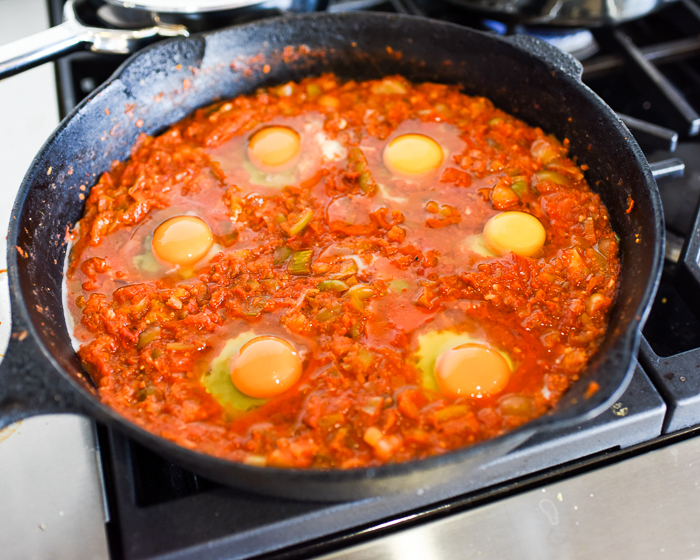 Let the eggs simmer in the tomato mixture for 3 minutes, then place in the oven for another 5 minutes, or until the whites of the eggs are set, but the yolks are still runny. 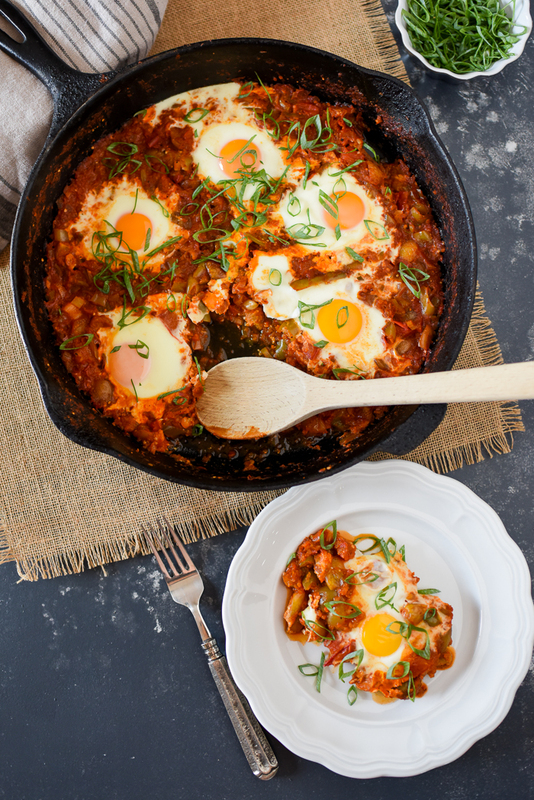 Remove from the oven, and with a large spoon, scoop up the eggs from the pan to a plate. Garnish with green onion slices and enjoy! 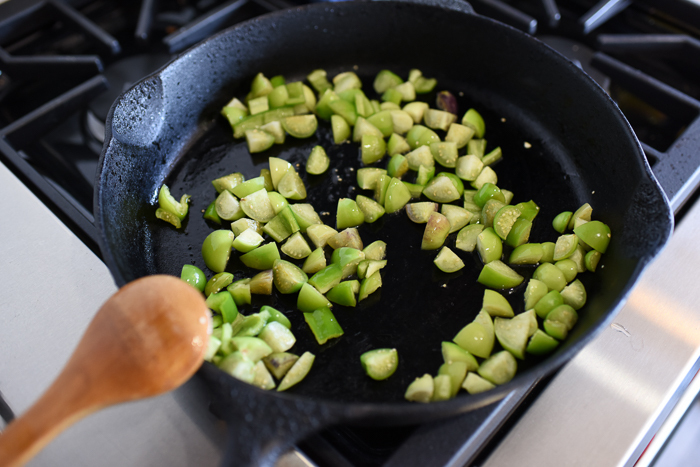 If you can’t find fresh hatch chiles, you can substitute 3/4 cup of roasted hatch chiles for the 1 1/2 cup of fresh! Disclaimer: Melissa’s Produce provided me with the fresh Hatch Chiles and Hatch Chile Powder for this dish. I wasn’t compensated in any other way, and all opinions are entirely my own. Woohooo!!! I was hoping that someone was like me and has a boatload of hatch chiles in their freezer!! 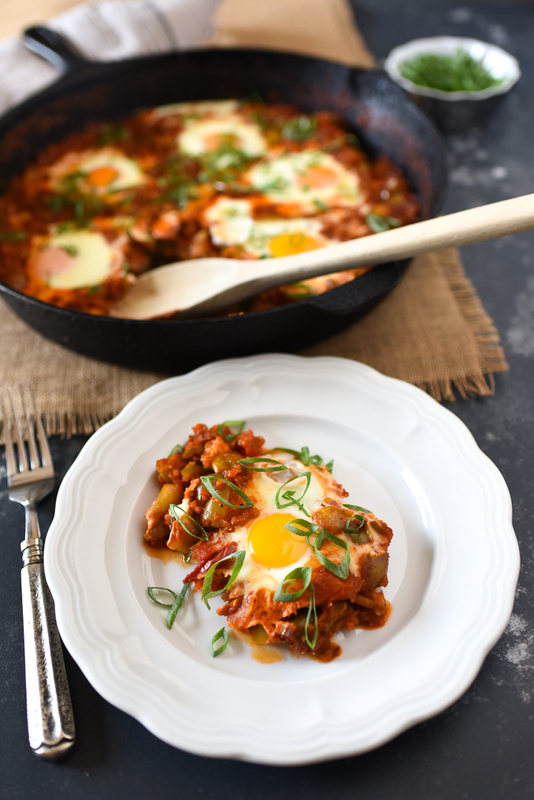 Really great self-care ideas, and a beautiful dish!